B & B with permit for sale in Pinoso, inland Alicante, Costa Blanca, Spain. There are 2 independent apartments with living room, kitchen corner and bathroom. One has 2 bedrooms, and the other has 1 bedroom. In addition, there are 5 en-suite bedrooms, 2 double rooms and 2 family rooms, together with the public dining room, the lounge and a great country kitchen. The current owner has developed this business into a thriving popular holiday destination for customers who are looking for a holiday surrounded by nature, yet within easy reach of many typical Spanish cities and coastal towns. The beautiful pool and bar are of course one of the attractions for young and old. 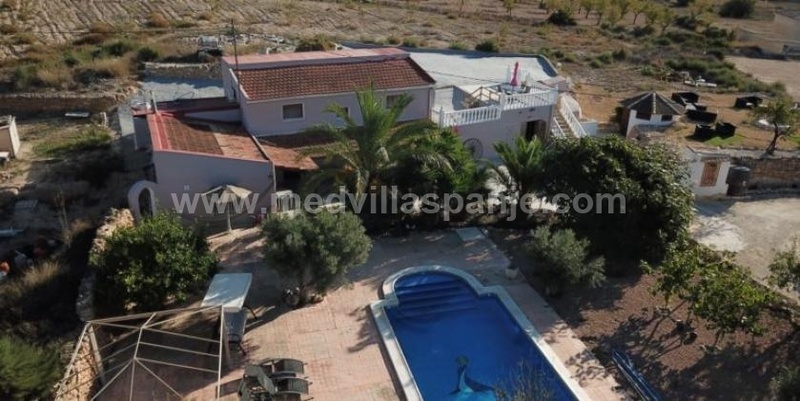 This beautiful Finca is close to several large towns and villages with a wide variety of bars, restaurants, banks, pharmacies, shops and much more. This b & b is located only 45 min from the airport and the sea of ​​Alicante and 35 min from Murcia airport.